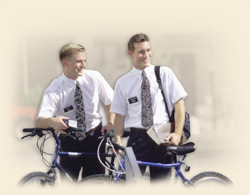 I have the great opportunity to work as a Ward Mission Leader in my Mormon Church congregation. It is great going out with the missionaries and sharing the gospel with friends and neighbors who may not have a relationship with God. I have seen some amazing things in the past few months as the Holy Spirit has worked miracles to ignite faith in people as they pray and study the scriptures. One of the things I look forward to nearly ever day, are the stories that the missionaries tell me of their daily adventures as they meet with people from all walks of life. My favorite ones are ones that involve members of our congregation as they help people in the community. The missionaries shared an example of this the other day. In our neck of the woods (the Seattle area) it tends to rain in waves this time of year. For example, it will be sunny for 20 minutes then a cloud will roll in and pour rain and it goes on like that throughout the day. One of the ladies that our missionaries have been teaching decided to walk to the store with her little child while it was sunny and on her way back a cloud rolled in and started pouring rain on her and the young child. She was very concerned about her child’s health and wondered if she would be able to make it home. Just then, a van pulled up to her and the door slid open. A large Samoan man looked at her and said “Get in the Van”! She said at first it was startling, but she had a good feeling so she got in the van. There were a few kids in the van along with the gentleman’s wife. They asked her where she lived and told her they didn’t feel right about having her left out in the rain. She told them where to go and she arrived safely at home. The next evening, the missionaries invited her to come to a woman’s activity at the church. She went and had a great time meeting members of the congregation. When she entered one of the rooms she looked up and noticed the same lady who had been in the van. They both did a double take and then got excited and hugged each other and started talking. I was so impressed with this Samoan family. Their actions were an example of the pure love of Christ that we preach about when we are out in the community with people. It is one thing to talk about helping others, but it is another thing to quietly go about doing good as Jesus did without recognition, which is exactly what our Samoan friends did. This left a greater impression on our friend who is investigating the Mormon Church than any sermon could have done. I am very grateful for the opportunity I have to work with these great members in our congregation along with the great missionaries and people they teach. I have witnessed the hand of God working through all of us who give of our time and try to live as Jesus would have us live. When we do this, miracles happen and lives are changed.